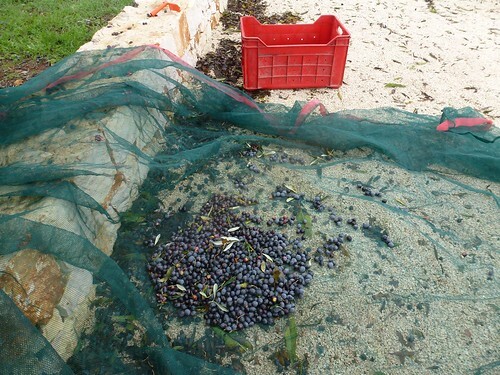 A bumper crop for our usual end of season close down and olive harvest weekend. After last year's spring pruning and low yield I was anticipating a big crop this year and so it proved. 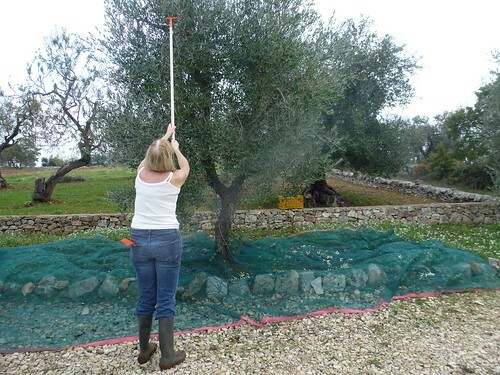 Olives are like many other trees and tend to produce larger and smaller crops in alternate years. In 2010 we harvested 84kg, in 2011 only 18kg. 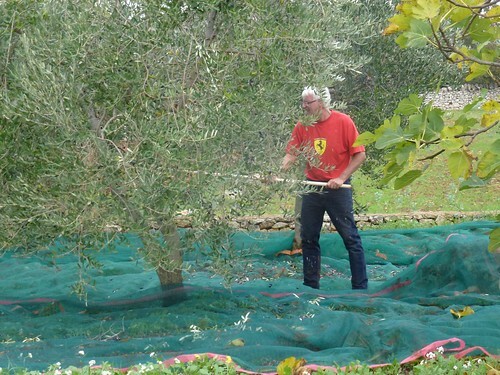 This year the haul was a record 93kg and there were still olives left on some trees but we were limited by time, accessibility and the capacity of our crates. This year Mary decreed "no ladders"; a couple of friends-of-friends have had nasty falls whilst harvesting. So we bought two broom handles and attached the little orange rakes to the ends. We are therefore limited to the reach of arm plus rake. I also went and harvested olives off our nearest neighbour's trees. They are still relatively immature trees so only added about 4 or 5 kg but every little helps. We took our olives (and a couple of 5L tins) round to Mino to add in with his as we did not have enough for the minimum pressing quantity of 220kg. He was taking his olives to the cooperative press that evening so we knew we would get our oil back Sunday or Monday. Knowing we were going to get our oil back from the press in time when we checked in to Ryanair we paid for a 15kg hold luggage. The yield this year was 13% so we would have produced 12 L in total. I double wrapped the tins in plastic bags and then rolled them in towels for the return trip. They arrived intact if a little dented but no leakage. They are now resting in the cellar ready for a pre-Christmas bottling.